Some aspects of keyword phrase research were covered in an earlier SEO article entitled Getting Started. I recommend reading that article before you read this one, as it provides a cursory introduction to Keyword Phrase research. Because you’ve reached web page creation, a critical point in the development of your website, you should do what you’ll almost always do when you reach a new stage of SEO development — you’re going to conduct some keyword phrase research. Keyword phrase research is the backbone of Search Engine Optimization because keyword phrases are one of the main criteria by which search engines determine a sites relevance. If, for instance, you sell cone shaped widgets and your website is www.cone-shaped-widgets.com and your copy is optimized for ‘cone shaped widgets’ and you have no competition, when somebody searches for ‘cone shaped widgets’ chances are your site will appear as #1 in the search engines results list. NOTE: The results page that appears on a search engine after you’ve conducted a search is known as a Search Engine Results Page, or SERP. The goal of SEO is to get your site ranked as high as possible of SERPS for specific keyword phrases. The purpose of Keyword Phrase Research is to determine the best possible phrases for your site. The more appropriate the phrases, the more success you will have. For this example we are going to utilize Wordtracker’s free keyword research tool. Let’s say you have a used car dealership are just beginning your keyword research. 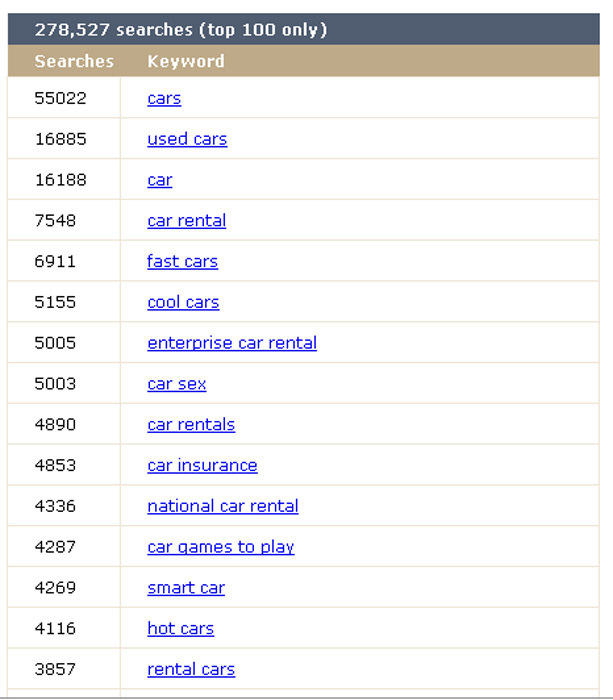 Here are the results you receive when you search for ‘cars’. According to the results, the term ‘cars’ has appeared in the Wordtracker database over 55,000 times in the past 90 days. An easy, although cursory, method of determining the competitiveness of a keyword phrase is to search the term on Google (or any other Search Engine). 1) Shows the keyword search box. The searched term in this instance is ‘cars’. 2) (The aspect of the SERP we are concerned with) shows how many websites are concerned with the term ‘cars’ – 422 million. That’s a LOT of competition. So you’ve got 422 million competitors…you’ll probably want to optimize your site for a less competitive keyword phrase. Let’s utilize Wordtracker again, but lets try the phrase ‘used cars’, since you are setting up a site for a used car dealership. Now we’ve got some manageable results. 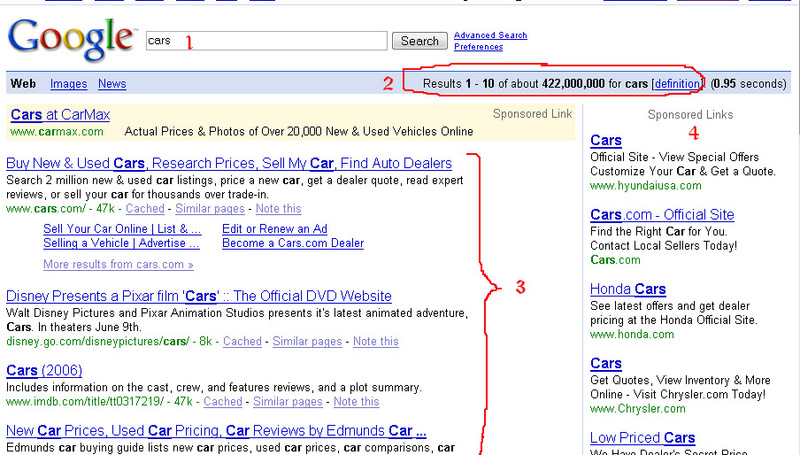 A Google results check shows that only 78 million sites list the term ‘used cars’. This is still a lot, so lets try to whiddle the competition down to a more reasonable number. NOTE: This is a cursory method of determining your competition, as any site that just mentions ‘used cars’ will be calculated in the results list. Keep in mind that only approximately 25% or less of the results are truly competition. Many beginning SEOs overlook an extremely importent aspect of SEO, optimizing for local, state, or region. If you only deal with a general area then you should optimize your site for that area. That way you’ll eliminate countless amounts of competition who do not serve your particular region. Let’s say your used car dealership is in Baltimore. 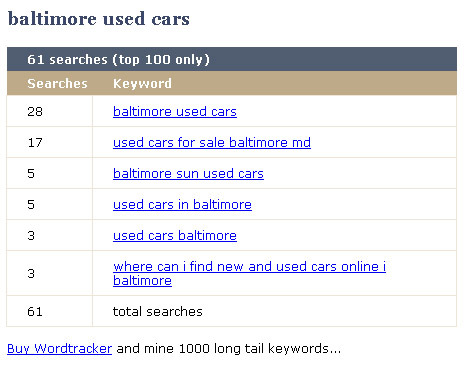 Search Wordtracker for the term ‘baltimore used cars’. 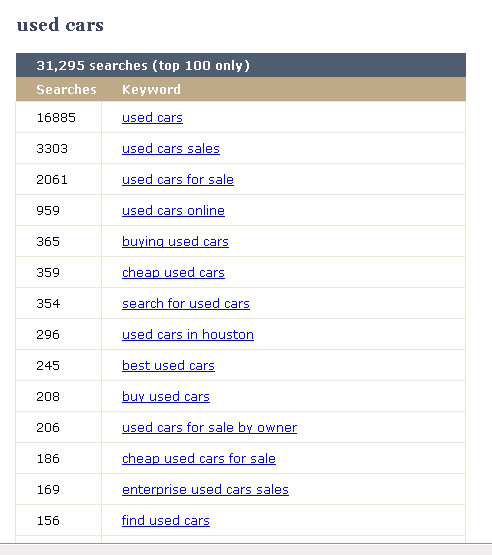 In the past 90 days, ‘baltimore used cars’ has been searched 28 times. NOTE: This only accounts for Wordtracker’s database (which gets select results from Search Engines). I recommend using these numbers as percentage estimates, meaning a term with 50 results will most likely be searched for twice as many times as a term with 25 results. While you may think to yourself, “approximately 16000 people are searching for the phrase ‘used cars’ in a 90 day period, there’s no way I’m not going to optimize for that phrase, especially if I’m optimizing for ‘baltimore used cars’, which is only searched 28 times.” This type of thinking does in many beginning SEOs. You ARE optimizing for the phrase ‘used cars’ because it is part of ‘baltimore used cars‘. However, at this point in your site development you are concerned with starting small and targeting specific, less competitive phrases. After you’ve created a web presence, you can go after the big dogs. Make a List of 10-20 keyword phrases that are relevant to your site (this will take some time) Stay focused, don’t stray from the topic of your website, even if it seems like a good idea. NOTE: The order of words DOES matter, so play around with word orders and test them with Wordtracker. http://www.seochat.com/seo-tools/keyword-difficulty/Now you should have a decent list of keyword phrases, which you will use throughout the creation of your Search Engine Optimized website.